Olad, A., Khatamian, M., Naseri, B. (2010). Preparation of Polyaniline Nanocomposite with Natural Clinoptilolite and Investigation of Its Special Properties. International Journal of Nanoscience and Nanotechnology, 6(1), 43-52. A. Olad; M. Khatamian; B. Naseri. "Preparation of Polyaniline Nanocomposite with Natural Clinoptilolite and Investigation of Its Special Properties". 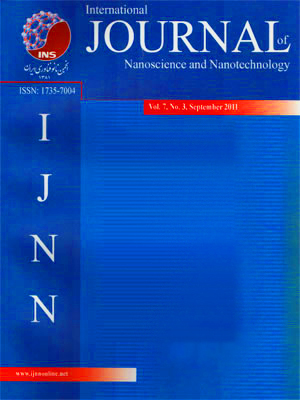 International Journal of Nanoscience and Nanotechnology, 6, 1, 2010, 43-52. Olad, A., Khatamian, M., Naseri, B. (2010). 'Preparation of Polyaniline Nanocomposite with Natural Clinoptilolite and Investigation of Its Special Properties', International Journal of Nanoscience and Nanotechnology, 6(1), pp. 43-52. Olad, A., Khatamian, M., Naseri, B. Preparation of Polyaniline Nanocomposite with Natural Clinoptilolite and Investigation of Its Special Properties. International Journal of Nanoscience and Nanotechnology, 2010; 6(1): 43-52. A nanocomposite of polyaniline (PANI) with natural clinoptilolite (Clino) was prepared by chemical oxidative polymerization of anilinium cations in the presence of clinoptilolite dispersion. The PANI/Clino nanocomposite was characterized using FTIR, XRD and SEM techniques as well as electrical conductivity measurement using four point probe technique. Cyclic voltammetry analysis was used to investigate the electroactivity of PANI/Clino nanocomposite. Also solubility of the nanocomposite was determined compared to the pure PANI. Formation of the nanocomposite and incorporation of polyaniline into the clinoptilolite channels were confirmed by FTIR spectra and XRD patterns. According to the results, increasing the zeolite content of PANI/Clino nanocomposite up to 0.5% w/w, increases the electrical conductivity of the nanocomposite, but further increasing of the zeolite content causes decreasing the conductivity. Cyclic voltammetry studies showed that the noanomposite is electroactive as well as pure PANI. Also according to the results of solubility tests, the solubility of PANI/Clino nanocomposite in N-methyl pyrrolidone solvent was improved.